The term risk premium for a month is the difference between average Long Interest Rate and average T-bill yield during that month. The credit risk premium for a month is the difference in average Moody’s Baa bond yield and average Long Interest Rate during that month. This definition assumes investors hold corporate bonds as a risky alternative to U.S. Treasuries of comparable duration. The equity risk premium for a month is the difference between the S&P Composite Index earnings yield at the end of the month (with lagged earnings, as specified above) and the average Long Interest Rate during that month. This definition assumes investors hold stocks over an extended period (10 years) as a risky alternative to U.S. Treasuries. To determine whether any current risk premium is undervalued or overvalued for a month, we subtract its average value over months for the prior 10 years (the Shiller “cycle”) from its current value and divide this difference by its standard deviation over months for the prior 10 years. The result is number of standard deviations above (positive values) or below (negative values) its average for the prior decade. Positive values indicate undervaluation of the premium, because the associated yield is “too high.” We later test sensitivity to length of lookback interval. The Best Value strategy each month allocates all funds to the asset corresponding to the risk premium with the greatest undervaluation at the end of the preceding month: VFIIX if the term risk premium is most undervalued; VWESX if the credit risk premium is most undervalued; VWUSX if the equity risk premium is most undervalued; and, Cash if none of the risk premiums are undervalued. 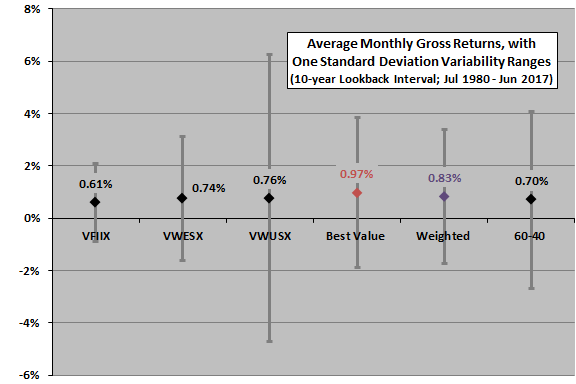 Since June 1980, the best value is Cash during 38 months, VFIIX during 123 months, VWESX during 116 months and VWUSX during 168 months. The Weighted strategy each month allocates funds to assets corresponding to all undervalued risk premiums by dividing level of preceding month undervaluation for each (in standard deviations, as above) by the sum of all undervaluations. 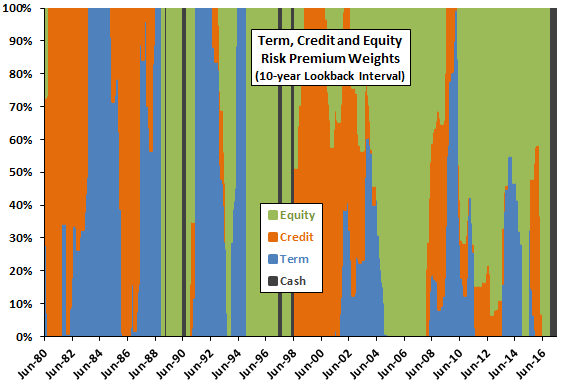 The following chart tracks allocations to risk premiums per this strategy since June 1980. It appears that the model is as attentive to bond premiums as it is to the equity premium. The strategy seldom goes to Cash. How do these two strategies translate into cumulative performance? Reallocate/rebalance at the close on the last trading day of each month (assume that all data can be accurately estimated just before the close). Results indicate that both the Best Value and Weighted strategies add value. Compound annual growth rates are 11.8%, 10.1% and 8.0% for Best Value, Weighted and 60-40, respectively. The Best Value strategy switches ETFs 55 times over the 37-year period, so trading frictions are low. These infrequent signals suggest that signal execution delays would have little effect. Maximum (peak-to-trough) drawdowns are -26%, -25% and -46% for Best Value, Weighted and 60-40, respectively. How do average monthly returns, as alternative measures of performance, compare? The next chart summarizes average monthly gross returns and standard deviations of monthly returns for the mutual fund components, the Best Value and Weighted strategies and the 60-40 benchmark. Rough gross monthly Sharpe ratios (average monthly return divided by standard deviation of returns) for Best Value, Weighted and 60-40 are 0.34, 0.33 and 0.21, respectively. 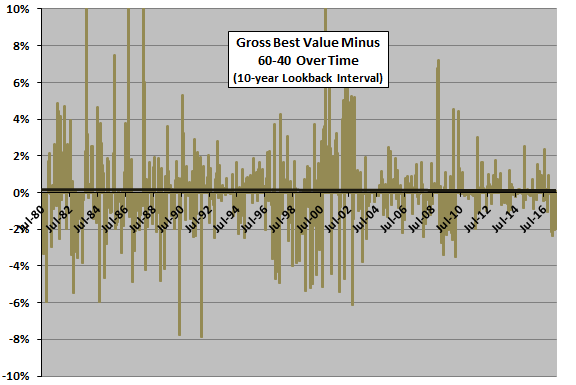 The next chart shows Best Value monthly gross returns minus 60-40 monthly gross returns over the available sample period, along with a best-fit trend line. Best Value outperforms 60-40 by an average 0.27% per month, winning 53% of all months. 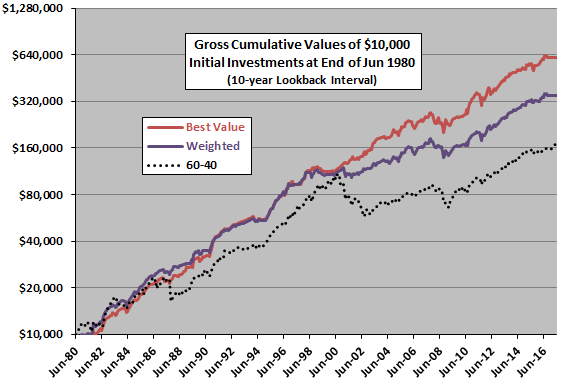 Results suggest outperformance of Best Value dissipates slightly over time. Weighted outperforms 60-40 by an average 0.14% per month, also winning 53% of all months. Are findings sensitive to the look-back interval used to assess risk premium valuation? 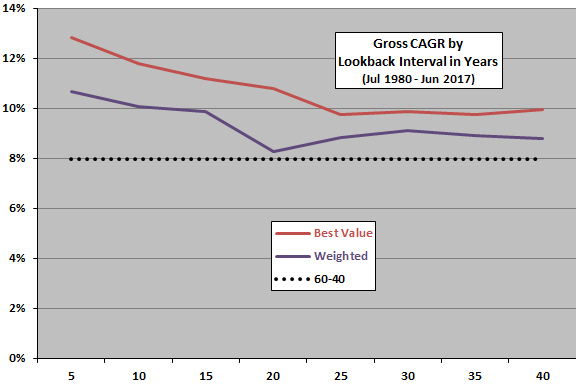 The final chart compares gross CAGRs for the Best Value and Weighted active strategies and the 60-40 benchmark using different lookback intervals to assess risk premium valuations, ranging from the last five years (5) to the last 40 years (40). Results indicate that relatively short lookback intervals are better than relatively long ones, but all lookback intervals for both strategies beat the 60-40 benchmark. One interpretation is that risk perceptions/tolerances change over time, and investors tend to base them on five to 15 years of historical data. However, the available sample period is not long for this kind of test. The lookback interval in “Simple Asset Class ETF Value Strategy” is inception-to-date (ITD), ranging from about 13 years to about 28 years. Substituting a 10-year look-back interval for the ITD interval in that short-term test slightly lowers CAGRs for both Best Value and Weighted strategies. In summary, evidence from the available test period suggests that SACEVS applied to mutual funds beats a relevant benchmark over the past 37 years, but magnitude of outperformance is somewhat sensitive to the lookback interval used for risk premium estimation. As noted, candidate assets and variables used to measure risk premiums are somewhat different from those used in “Simple Asset Class ETF Value Strategy”. Some of the substitutions introduce approximations. As noted, calculations above ignore fund switching frictions. There may be none. As noted, strategy outperformance is somewhat sensitive to the length of the lookback interval used to determine overvaluation/undervaluation of current risk premiums, and the available sample is not long for sensitivity testing. Other mutual fund vehicles for capturing term risk, credit risk and equity risk premiums may work better or worse. However, brute force experimentation would introduce snooping bias.